Do indemnity agreements constitute evidence of independently wrongful behavior in interference with economic advantage claims? California courts have long recognized causes of action for tortious interference with contract and tortious interference with prospective economic advantage, with the former considered a subspecies of the latter1 In recent years, the courts have modified the elements needed to prove tortious interference, particularly in economic advantage cases. One result of these changes has been the creation of considerable misunderstanding over the role that indemnity agreements may play in proving tortious interference. 1) The existence of a valid and enforceable contract between the complainant and a third party. 2) Knowledge by the interfering party of the existence of that contract. 3) Intentional acts by the interfering party designed to induce5 the third party to breach or disrupt its contractual relationship with the complainant. 4) Actual breach or disruption of the contractual relationship. 1) The existence of a prospective business relationship between the complainant and a third party containing the probability of future economic benefit to the complainant. 2) Knowledge by the interfering party of the existence of the relationship. 3) Intentional acts by the interfering party designed to cause the third party to disrupt the relationship with the complainant. 4) Actual disruption of the relationship. Until recently, however, there was very little, if any, support for the proposition that merely proving that a defendant’s conduct was not independently wrongful was sufficient to sustain the defense of competition.12 Moreover, most of the cases indicated that whether the mere absence of a wrongful act was sufficient to establish the defense was a question for the jury to decide,13 and no authority suggested that it was anything but the defendant’s burden to prove that point. Significantly, none of these cases involved an alleged interference with contract claim. The PMC holding thus is consistent with the Restatement (Second) of Torts, prior California case law, and case law in other jurisdictions. These authorities all suggest that an indemnity agreement may, in fact, be relevant in proving an interference with contract claim. This principle was implied by the California Court of Appeal in Charles C. Chapman Building Co. V. California Mart,36 a case decided more than two decades before Della Penna. In Chapman, the plaintiff landlord had entered into lease agreements with several tenants. California Mart apparently persuaded several tenants to move their premises by offering them inducements, which included free rent for a period of time and buyouts of their leases with the plaintiff. The court of appeal found first that, although the relationships between many of the vendors and the plaintiff were disrupted, there were no actual breaches of the leases because all the rents were paid in full. The court then proceeded to analyze whether the defendant’s agreement to pay the rent of the vendors constituted an improper inducement. Similarly, in jim-Bob, Inc. v. Mehling,42 the Michigan Court of Appeals concluded that an indemnity agreement is relevant to the issue of intent to interfere with a contract. In that case, the plaintiff was a tenant of defendant property owners, Mehling and Dawson. As the parties were negotiating a new lease, the Auto Club made an offer to purchase the property from Mehling and Dawson, but the owners rejected it. The plaintiff claimed that later, after the new lease had been finalized, the Auto Club increased its offer, including an agreement to indemnify Mehling and Dawson if the plaintiff sued them for not honoring the lease agreement. Mehling and Dawson accepted this offer, and the Auto Club then attempted to evict the plaintiff from the premises. In Edward Vantine Studios, Inc. v. Fraternal Composite Service, Inc.,44 the Court of Appeals of Iowa affirmed a jury’s finding that the defendant had tortiously interfered with certain contracts. The plaintiff and defendant were competitors in the business of photographing composites of fraternities and sororities. The plaintiff had existing contracts with several fraternities and sororities at Iowa State University. The defendant visited many of these houses and, when told that they already had existing contracts with the plaintiff, suggested that the organizations “investigate the validity of” those contracts. The defendant subsequently signed contracts with 12 houses that were already bound to contracts with the plaintiff. In 11 of those contracts, the defendant agreed to indemnify the houses for any legal costs or fees incurred in breaking their contracts with the plaintiff. Some tortious interference defendants have sought not only to exclude indemnity agreements from evidence but to avoid even routine discovery concerning the nature of an indemnity agreement, including the production of the agreement itself. Such positions have been taken under the guise of a joint defense privilege, claiming that all communications (including the actual negotiations concerning the indemnity agreement) are attorney-client privileged. Some defendants have attempted to bolster their position by merging the indemnity agreement with a three-way retainer agreement with a law firm, the discovery of which some judges have been loathe to order. 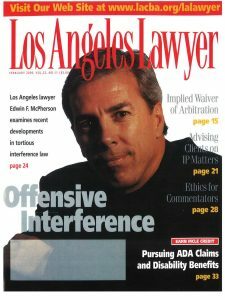 Under California law, the determination of whether communications between parties are privileged turns upon an analysis of the communications within the context of the attorney-client privilege.47 The general rule is that disclosure of attorney-client communications to third persons destroys whatever confidentiality otherwise exists unless “involvement of third persons to whom disclosure [is made] is reasonably necessary to further the purpose of the legal consultation.”48 Obviously, then, the two parties have to have the same purpose in mind for the communication. The parties to an indemnity agreement, however, most decidedly do not have the same purpose in mind for their communications with each other, and therefore do not enjoy any communications privilege.49 In an interference with contract case, a third party acts for what is essentially the goal of stealing (or steering) a contracting party away from another contracting party. As part of the negotiation process, either the third party offers or the contracting party demands that the third party will indemnify the contracting party in the event that the other party to the contract brings suit. Defendants in tortious interference cases have also argued that the probative value of an indemnification agreement is outweighed by the danger of undue prejudice or confusing the issues and/ or misleading the jury, and therefore should be excluded under Code of Civil Procedure Section 352. However, the only such danger generally cited by defendants is that the jury might construe the indemnity agreement as an admission of liability on the part of the indemnitee. For instance, in Freeman v. City of Santa Ana,51 the Ninth Circuit held that evidence of an indemnity agreement should be excluded if the plaintiff is able to prove liability (of the indemnitee) through other evidence. However, the Freeman case was not a tortious interference case but a simple contract case. It makes a certain amount of sense to consider the exclusion of an indemnity agreement in a breach of a contract case when the only issue to be proved is whether or not the indemnitee breached the underlying agreement. It is, however, not equally logical to exclude evidence of an indemnity agreement when a plaintiff is trying to prove knowledge by the indemnitor of the existence of the underlying agreement, the intent of that party to interfere with the agreement, and the actual interference by that party. Neither PMC nor any other case suggests that an indemnitor/competitor is in any Way immune from liability for tortious interference with contract-or that the indemnity agreement cannot be used as evidence of that interference, the competitor’s knowledge of the existence of the contract, or its intent to interfere. On the contrary, it is quite clear that an indemnity agreement can and should be used precisely for this purpose. 1. Aalgaard v. Merchants Nat. Bank, Inc., 224 Cal. App. 3d 674, 274 Cal. Rptr. 81 (1990); Shapoff V. Scull, 222 Cal. App. 3d 1457, 1464, 272 Cal. Rptr. 480 (1990); Dryden v. Tri-Valley Growers, 65 Cal. App. 3d 990, 994, 135 Cal. Rptr. 720 (1977). 2. See Knott v. McDonald’s Corp., 147 F. 3d 1065, 1068 (9th Cir. 1998); PMC, Inc. V. Saban Entertainment, Inc., 45 Cal. App. 4th 579, 52 Cal. Rptr. 2d 877 (1996). 3 For a detailed discussion of the two causes of action before 1995 in the context of the entertainment industry, See Edwin F. McPherson, In the Line of Fire, Los ANGELES LAWYER, Apr. 1996, at 39; How Talent Representatives Can Fight Client Flight, ENTERT. L. FIN., July 1995. 4. Causes of action for negligent interference with economic advantage and with contract also exist and have similar pleading requirements. See, e.g., National Medical Trans. Network V. Deloitte & Touche, 62 Cal. App. 4th 412, 439, 72 Cal. Rptr. 2d 730 (1998). 5. The word “induce” is defined as “to bring on or about, to affect, cause, to influence an act or course of conduct, lead by persuasion or reasoning, incite by motives, prevail on. See also seduce.” BLACK’s LAW DICTIONARY 915 (rev. 4th ed. 1968). 6. Quelinane Co. V. Stewart Title Guar. Co., 19 Cal. 4th 26, 55, 960 P. 2d 513, 77 Cal. Rptr. 2d 709 (1998), (citing Pacific Gas & Elec. Co. V. Bear Stearns & Co., 50 Cal. 3d 1118, 1126, 791 P. 2d 587, 270 Cal. Rptr. 1 (1990)); see also National Medical Trans. Network, 62 Cal. App. 4th 412; Shapoffv. Scull, 222 Cal. App. 3d 1457, 1464-65 (1990); Dryden V. Tri-Valley Growers, 65 Cal. App. 3d 990, 994 (1977); Contemporary Investments, Inc. V. Safeco Title Ins. Co., 145 Cal. App. 3d 999, 1002, 193 Cal. Rptr. 822 (1983); Mayes V. Sturdy Northern Sales, Inc., 91 Cal. App. 3d 69, 78, 154 Cal. Rptr. 43 (1979); Buckaloo V. Johnson, 14 Cal. 3d 815, 827, 537 P. 2d 865, 122 Cal. Rptr. 745 (1975); 3 B. WITKIN, CAL. PROCEDURE, Pleading §630 at 2259 (2d ed. 1971). 7. CrossTalk Prods., Inc. v. Jacobson, 65 Cal. App. 4th 631, 76 Cal. Rptr. 2d 615 (1998); Pacific Gas & Elect, 50 Cal. 3d 1118; Youst V. Longo, 43 Cal. 3d 64, 71 n.6, 729 P. 2d 728, 233 Cal. Rptr. 294 (1987); Seaman’s Direct Buying Serv., Inc. V. Standard Oil Co., 36 Cal. 3d 752, 686 P. 2d 1158, 206 Cal. Rptr. 354 (1984); Buckaloo V. Johnson, 14 Cal. 3d at 827. 8. In certain instances, all the elements of a tortious interference claim might be present, but the interfering party may be able to avoid liability due to some justification or privilege. The most notable such privilege is commonly referred to as the manager’s privilege. “Manager” has traditionally meant an employee of a corporation (as opposed to an outside representative) who has a management function and who is acting on behalf of the corporation. However, the definition of “manager” in this context is, in fact, broader and includes outside agents and advisers of the breaching party. Aalgaard v. Merchants National Bank, Inc., 224 Cal. App. 3d, 674, 686 (1990). A manager is said to be privileged to induce the breach of an employment contract between his employer and another employee….The privilege also extends to non-employees who serve as business advisors or agents and is applicable to advice relating to contracts generally, not just employment agreements. [Citations] A business advisor may counsel his principal to breach a contract that he reasonably believes to be harmful to his principal’s best interests. Id. at 80 (quoting Los Angeles Airways, Inc. V. Davis, 687 F. 2d 321 (9th Cir. 1982)). Other forms of justification may include interfering with a contract, the “enforcement of which would be injurious to health, safety, or good morals” or the “interest of labor in improving working conditions…” See Olivet v. Frischling, 104 Cal. App. 3d 831, 841, 164 Cal. Rptr. 87 (1980) (quoting Imperial Ice Co. v. Rossier, 18 Cal. 2d 33, 35-36, 112 P. 2d 631 (1941)). 9. The defense of competition is really a species of the privilege defense. Traditionally, in order to prevail on this defense, a defendant had to plead and prove the following: 1) the relation with which the defendant interfered “concerns a matter involved in the competition between” the defendant and the plaintiff, 2) the defendant did not employ wrongful means in so interfering, 3) the defendant’s conduct “does not create or continue an unlawful restraint of trade,” and 4) the defendant’s “purpose is at least in part” to advance its “interest in competing” with the plaintiff. Bed, Bath & Beyond of La Jolla, Inc. V. La Jolla Village Square Venture Partners, 52 Cal. App. 4th 867, 880, 60 Cal. Rptr. 830 (1997) (citing Charles C. Chapman Bldg. Co. V. California Mart, 2 Cal. App. 3d 846 (1969)). Proof of mere “competition is not sufficient to prevail on this defense.” Saunders V. Superior Court, 27 Cal. App. 4th 832, 843, 33 Cal. Rptr. 2d 438 (1994). 10. As emphasized by the California Supreme Court in Environmental Planning and Info. Council v. Superior Court, 36 Cal. 3d 188, 194, 680 P. 2d 1080, 203 Cal. Rptr. 127 (1984), and even later in Pacific Gas & Elec., 50 Cal. 3d at 1126: “When the defendant’s action does not interfere with the performance of existing contracts, the range of acceptable justification is broader. 11. Los Angeles Equestrian Center, Inc. V. City of Los Angeles, 17 Cal. App. 4th 432, 449, 21 Cal. Rptr. 2d 313 (1993); Pacific Express, Inc. V. United Airlines, Inc., 959 F. 2d 814, 819 (9th Cir. ), cert. den., 113 S. Ct. 814 (1992); Tominaga V. Shepherd, 682 F. Supp. 1489, 1497 (C.D. Cal. 1988); see also BAJIC 7.86 (7th ed.). 12. See, e.g., Pacific Gas & Elec. Co., 50 Cal. 3d 1118; Youst V. Iongo, 43 Cal. 3d 64, 71 n.6, 729 P. 2d 728, 233 Cal. Rptr. 294 (1987); Seaman’s Direct Buying Serv., Inc. V. Standard Oil Co., 36 Cal. 3d 752, 686 P. 2d 1158, 206 Cal. Rptr. 354 (1984); Buckaloo V. Johnson, 14 Cal. 3d 815, 827 (1975); Rickel V. Schwinn Bicycle Co., 144 Cal. App. 3d 648, 192 Cal. Rptr. 732 (1983); BAJIC 7.86 (7th ed.). 13. See, e.g., Lowell V. Mother’s Cake & Cookie Co., 79 Cal. App. 3d 13, 20, 144 Cal. Rptr. 664, 669 (1978) (“[T]he determination of whether the defendant’s conduct of interfering with. . .prospect:iVe economic advantage is privileged comprises a factual issue to be decided upon all the circumstances of the case.”); Kentucky Cent. Life Ins. Co. V. LeDuc, 814 F. Supp. 832, 840 (N .D. Cal. 1992) (The determination as to whether an activity is privileged involves consideration of factual matters, and is “peculiarly a question for the trier of fact.”). 14. Della Penna V. Toyota Motor Sales, U.S.A., Inc., 11 Cal. 4th 376 (1995). 15. See also Bed, Bath & Beyond of La Jolla, Inc. v. Iajolla Village Square Venture Partners, 52 Cal. App. 4th 867, 881 (1997). 16. Della Penna, 11 Cal. 4th at 392. 17. See also National Medical Trans. Network v. Deloitte Touche, 62 Cal. App. 4th 412 (1998); Amtz Constr. Co. V. St. Paul Fire & Marine Ins. Co., 47 Cal. App. 4th 464, 476, 54 Cal. Rptr. 2d 888 (1996). 18. Quelimane Co. V. Stewart Title Guar. Co,, 19 Cal. 4th 16, 55 (1998). 19. Della Penna, 11 Cal. 4th at 378. 20. Id. at 40809 (Mosk, J . concurring). 21. Amtz Constr. Co., 47 Cal. App. 4th at 477. 22. Willard V. Caterpillar, Inc., 40 Cal. App. 4th 892, 48 Cal. Rptr. 2d 607 (1995). 23. PMC, Inc. V. Saban Entertainment, Inc., 45 Cal. App. 4th 579 (1996).